Who is Kharma? How does a company making the Exquisite Grands, one of the most expensive speakers in the world relate to being green? What makes such a speaker world class? …and, does being a Dutch company change the company’s outlook? Truth-be-told, Kharma International was a bit of a mystery to me at THE Show 2013 in Newport Beach. I knew a little, but that was limited to their speakers and amps being extremely rare, sought-after, and exotic, and I had read that they had designed one of the most expensive speaker systems in the world for some lucky person in Belgium (No.2 most expensive, according to this list). Beyond that, Kharma was a bit too far outside of my green radar. As I would come to find out, we actually had a few surprising things in common. For one, manufacturers such as Kharma share a concern in that they too work very hard to convince people that providing value typically requires a higher price point. Likewise, being green is not typically inexpensive. I’ve written about this in previous posts, but this reality isn’t always self-evident to many people. There is still a stygma that links green products to being less expensive than mass-produced products. The fact is that mass-produced products cut corners, sometimes in dangerous ways and I started this blog to point this out. Being green as well as being exclusive both require a different thinking about value. Kharma: stately, world-class, ...and substantial! As I was going to be in the Netherlands this Summer, I asked Kharma’s US Marketing manager that I met at THE Show, Vivienne van Oosterum, if I could possibly visit the Kharma factory while I was local. She was gracious enough to invite me. Graciousness, by the way, is often rare in HiFi, and Vivienne as well as Gerard van Ooijen, the Production Manager, and also the rest of the Kharma team I met at the factory were gracious, down-to-earth, and quite open about the company, the products, the marketing, and pretty much anything I asked about. Now I’ve had very good discussions with manufacturers over the years (my experiences with Ayre, Vandersteen, and Zu immediately come to mind) but with a product that sells to princes, one would expect quite a bit more deference. So it was very refreshing to speak to folks who seemed to understand that even audiophiles can be ordinary people too. As I was doing some preliminary research for this article, I ran into more trepidation. The Kharma website, the online reviews, and the blog comments vary considerably. The fact is that Kharma’s primary focus is still to bring people to the pinnacle of audio nirvana – their company slogan is “beyond imagination,” and this is definitely a company that strives to bring you there. Their all-flash website, the intro video, and the media library show images of raw gold ore, beautiful women, expensive sports cars, and exotic animals surrounded by a mysterious exclusivity that permeates the site. Likewise, online reviews gush over the immaculate construction and appearance, the exquisite sound, and the exotic materials of the review samples, while carefully suggesting that finding dealers, demos, and meeting the high prices are still significant barriers to owning their products. Blog posts are a mixed bag, some acknowledge the beauty and excellence, but most bemoan the unobtainability. Of course, this is primarily regarding the Exquisite line, and perhaps with good reason: if everyone had Kharma speakers, then it wouldn’t be very Exquisite anymore. We’ve all heard this said elsewhere before, but Kharma in their own way also seeks to ask what would be possible from an engineering and design perspective if there were no barriers at all. The answer? The Kharma Exquisite Extreme Grand Limited, a speaker so exclusive that only 25 pairs will ever be made, with the customer’s choice of colors, rare wood finishes, gold inlays, bejeweled surrounds, and the very best technology available at any price. A gift for kings not unlike Borzois, Cartier watches, and Spyker sports cars, the latter of which Kharma actually produces speakers for. This is not unlike the Bang & Olufsen partnership with Aston-Martin or the Burmester system available with the Porsche Panamera. It is only natural that Kharma would partner with Spyker, they even have a similar stylistic feel. Obviously, back here at GreenHiFi this is definitely reaching outside my comfort zone. I’ll recognize that there must be a market for such a product, but beyond that I’m more interested in the technology inside. To that end, I still wanted to hear what a speaker at that level would actually sound like, without the encrusted diamonds and rare woods, which I worried weren’t from the most green sources (although at these price points, even that can be arranged, I’m sure). Fortunately for me, they actually had a listening room with a pair of Exquisite Midi Grands, which are just a couple of levels below the top speaker but likely retain most of the technology I was interested in hearing. It was connected to a full complement of Kharma Exquisite amps, cables and preamps, and some equally exotic third-party digital sources even I was not familiar with. That this would sound good, was not going to be a surprise, but a unique opportunity nonetheless. The only Kharma speaker I had heard before my visit was the Elegance DB9 at THE Show in Newport. If my memory served me right, it shared the same sound signature with these Exquisite Midi Grands I was hearing at Kharma. This beautiful speaker is not only larger and shaped differently than the DB9, but has considerably better technology, yet it sounds remarkably similar. While I’ve only heard these two speakers, I’m going to guess that there is actually a Kharma “house sound,” and that this trickles down to all their models. This is consistent with what other reviewers had heard as well. I’m not one to use too much audiophile-speak, but for lack of having other terms to use, I can say that Kharma speakers are beautifully consistent top to bottom, with nothing sounding overemphasized. One absolutely stunning work of art, ...and this isn't even their top of the line! I’ve read (not heard, though) in other reviews that the older and quite popular (here in the US) Ceramiques are a tad hot in the mid-treble. These speakers did not exhibit this at all. The sound of the Exquisite Midi Grands was big, engrossing, and extremely detailed but also non-fatiguing – I could listen to them for hours. The bass was rich, powerful and tight and complemented the sense of air and ease that I heard. The room also had a pair of Exquisite series subs that I suspected were producing this prodigious bass, so I asked to have those turned off. To my surprise, the bass was still all there, albeit a tad lighter and perhaps a bit less extended, but really, that is splitting hairs, very fine ones, at that. We listened to a Bach recital and the sound was all there from the airiest highs to the lowest registers and the progression between was pure consistency. The proverbial analogy to actually being in the cathedral sitting in front of the orchestra was eerily true, but I would almost say that it felt as if I was also transported back to the early 18th century – it was that engrossing. This is indeed a world-class speaker. Regarding the construction, this is one incredibly solid speaker. When I asked whether there was any danger of these tipping over (after all, here in California, the earth does move every once in a while), I was reminded that this monolith weighs over 400 kilos (approx. 1000 American pounds). A grown man can lean against it comfortably without worry – don’t try this against a Dynaudio Evidence speaker. It also has some of the most robust high-grade aluminum feet I’ve ever seen on a speaker. The speaker itself is absolutely beautiful, with a distinct and unique shape not found anywhere else. The surface of the speaker is stunning, more striking than pictures can convey, with beautiful wood and metal inlays. Likewise every seam is identical and even. The attention to detail is remarkable – I am proud to say: this is Dutch design and engineering at its best. I had an opportunity to also see the assembly room where two of these speakers were laying half assembled. Just as the feeling one gets when an orca sidles up in front of you at Sea World, this speaker seems even larger up close. The cabinets are made of 40mm (over 1.5”) HPL, the highest and most dense grade of wood composite generally available, I believe. Drivers are made of extremely difficult to produce Kharma-manufactured carbon-fiber cone materials. Internal wiring involves very high grades of silver and gold, and the tweeters are made of actual diamonds (really). While many manufacturers will claim this, Kharma does indeed use some of the most hard to find and exquisite materials in the construction of its speakers… when this provides a sonic improvement. I mean to emphasize this: I really did not get the feeling that what goes inside the speaker is in any way expensive just for the sake of being expensive – there has to be a sonic reason for the selection of materials. While I can’t say the same for what goes on the outside of their most exotic speakers, that serves another purpose, of course. Even there, though, these options are only offered if it will not affect the sound in any way – the perfection of sound reproduction, being after all, the ultimate goal. So how does Kharma relate to being green? I thought this would be a hard question to answer. Surprisingly, there is much to Kharma that is green, even if that wasn’t the goal initially. For example, Mr. van Ooijen told me that their cables do not use Teflon, which it turns out is an extremely carcinogenic product who’s manufacture is also violently toxic to the environment. Kharma chose not to use Teflon because it simply does not sound very good – according to a follow-up discussion I had with Ms. van Oosterum, it imparts a harsh quality to the sound which does not match the desired Kharma sound signature (a house sound?). While not using Teflon had another purpose initially, the avoidance of Teflon is good for the environment as well. We can certainly agree on that. Another point is related to materials. Because Kharma uses some of the finest materials available and pays a higher price for them, this also ensures higher quality for these materials and the eventual assembled product. This makes green issues such as the acquisition of parts from unknown sources less of a concern. Given that they use diamonds, one of the more contentious gems in the world right now, this is a particularly salient point. Kharma does not have to source from disreputable sources in order to meet a price-point that competes at the bottom of the market with other less scrupulous manufacturers. In essence Kharma stands at the polar opposite of the walmartization of consumer electronics and the inevitable effect this has on quality. This is a good thing. In a round-about way, a higher price-point also helps with related issues such as the cost of labor and the treatment of employees, which are also green concerns. It follows that Kharma doesn’t need to unnecessarily cut corners on labor and they don’t. While I was at the factory I asked if the employees were treated well, and the response was that there were no issues there. Sure, any company will say that, but the way Mr. van Ooijen said this, it was believable. I've asked this of many manufacturers in the past, and I don't always get the same sense of confidence in an answer. I also didn’t notice anything indicating otherwise from the people I encountered at the factory. People seemed happy to work there, and the atmosphere was relaxed, inviting, and calm. This sense of ease is a stark contrast to the deadlines and budget-focused, time-is-money hustle of your typical American manufacturer back here in Southern California. As I always do, I asked what kinds of speakers Mr. van Ooijen and Ms. Van Oosterum had at home. This is a bit unfair of me to ask because it is a round-about way to see if they could afford such speakers on their income, ie. I'm asking if the company provides well enough for it's employees. When I'm asking this of employees who produce extremely expensive products, this isn't always a fair question to ask. Mr. van Ooijen said, very diplomatically, that he used a pair of home-made speakers but assured me that they sounded excellent. I presume that, being the lead engineer, he probably had speakers at home that were quite similar to the ones he was developing at work. Ms. van Oosterum, however, enjoys a very nice Kharma Matrix surround system at home. Being the daughter of the founder of the company, Charles van Oosterum, this wasn’t really a question she could answer differently. Anyhow, I ask this question of everyone I meet in this industry, so take from it what you like. Another good point that Mr. van Ooijen made was that because they use extremely expensive parts, this discourages waste. When cables are made with solid gold and speakers are cut from one of the more dense materials possible, those are not component parts where one can simply sweep the extras into the trash. I surmised that this sentiment permeates the entire manufacturing process and is likely to trickle down to even the less expensive products – basically: that this is the norm at Kharma, which I am fairly certain it is. For example, I noticed that there was considerable pride in talking about components, parts, and materials – there is a sense of ownership, a personal investment, in the final product. This indicates that the component parts are valuable and that these are to be cared for with respect, in much the same way I feel about green values. I presume there is also a bit of Dutch-ness to this company’s mantra, too, something that perhaps echoes the Protestant work-ethic that is so prevalent in the Netherlands. Obviously, this is a generic term and applies to non-Protestants too. It is something I know from being raised there and also from what I have witnessed around me each time I return. For example, the meaning of the word “neat” has a whole other dimension in the Netherlands, and this is reflected in the products that are produced there. This can be seen for example, in the way that pollution and waste are treated – quite conscientiously, as it turns out. I realize that I’m making some big generalizations, but I really did get the sense that this sense of responsibility is alive at Kharma. For example, the factory was surprisingly clean and neat, something that isn’t always the case with other manufacturers that I’ve visited. Unless they hustled to clean everything thoroughly before I arrived (the way I do before my in-laws come to visit), there was really a sense that this is just the way things are all the time. This brings me to another green concern: more efficient and compact designs. Generally speaking, big, bold, curved, and ostentatious products are very much against Dutch style, manufacturing and design, which is typically diminutive, utilitarian, angled and modern. Ms. van Oosterum was quick to point out that Kharma also has smaller, more traditional lines and models too, and this is certainly the case, but there is another explanation that may not be as obvious. Take for example the complexity and difficulty involved in driving big sound from a smaller cabinet – this often requires difficult engineering and complicated design choices, which may not at all be that green. Also, this can involve significant compromises to the sound and sometimes even use psycho-acoustic tricks. This would not really be in line with Kharma’s company philosophy that I described earlier. Instead, it is my belief that there is a time & place for large and heavy products: when it fits the engineering and design need at hand. It that case, the product needs to be large and bold for the same reason that a grand piano is: there is simply no better way to extract acceptable performance from something smaller. Perhaps a passable sound can be weaned from a smaller, upright piano, or, in the extreme, a synthesized keyboard, but most people would agree that the sound will suffer unacceptably as the instrument decreases in size. For example, I own a pair of Vandersteen 3A speakers: big, heavy, and some would say, quite unattractive cloth-covered pillars on each side of my listening room (one visitor thought they were just acoustical treatments). They require at least 150W of power that I drive from a much beleaguered NAD amp. I also own Magnepan speakers, also big, but at least they are thin and easier to move around (they also look like acoustical panels). Likewise, they require a solid amp and the NAD is just barely able to keep up with them. Then I have smaller pair of Canton Karat speakers that I use for home theater and that dip into 4 Ohms, so they still need a good 50W of clean power to sound good. Finally I have my beloved Zu Soul Superflys that I am currently powering with a diminutive 15 watt tube amp. I won’t list all the bookshelf speakers I have lined up as well, but my point is that with each step down in size and power, compromises have to be accepted. While certainly not in the same league as the Kharmas, my precious Vandersteens are still the largest most open-sounding, most full-range speakers I have. When I want to feel the pure visceral power of the opening moments of Straus' Also sprach Zarathustra (the theme to the blockbuster 2001: A Space Odyssey, to those who don't care for classical), or the glory of the chorus in Vangelis' Mythodea, a tribute to the 2001 Mars Odyssey shuttle entering Mars' orbit, then I connect up my big, bad Vandersteens. Large sound requires large equipment, there is simply no way around that fact. All that being said, it is ultimately about application – there is a place for the Exquisite line, but there is also a place for smaller and more agile products such as my Zu Speakers. 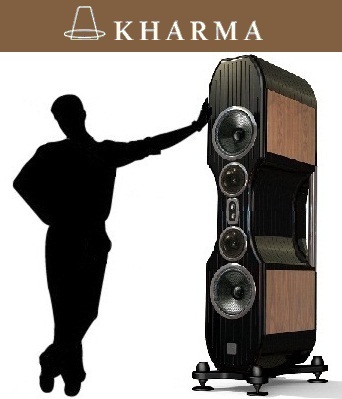 Kharma is well known for their large, beautiful well-reviewed and often quite expensive world-class speakers, but they are not a company to simply rest on past glories. As it turns out, they are well aware of the global down-sizing trend, so they do indeed have smaller lines, models, and even (gasp!) a class-D amplifier in the line-up. They are developing these and other new products as well, and I will cover them in Pt. 2 of my report on Kharma International. If you have any comments, please feel free to post below.